Use paint with low levels of volatile organic compounds (VOCs), which, in non-scientific terms, are chemicals that evaporate into the air. Basically, you don’t want anything to do with them – not only do they smell unpleasant, they’re also harmful to the environment. 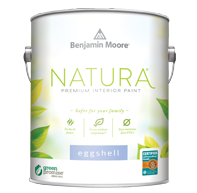 Paints with low levels of VOCs — like our Preserve paint for interior jobs and Select 1000 for exterior painting, have little to no odor and comply with strict federal regulations. 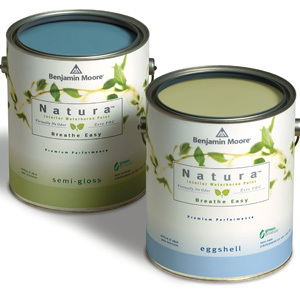 Eco-friendly paints like these are perfect for kids’ rooms. According to the United States Department of Energy, eco-friendly window treatments can reduce energy waste – and energy costs – by 20 percent each year, which translates to $325 in savings for the average family. Cellular shades or Hunter Douglas NewStyle hybrid shutters, which look like real wood shutters but have the strength and stability of synthetic materials, are great options for upgrading to stylish and environmentally responsible window treatments. Making the switch to eco-friendly flooring doesn’t mean you have to give up your carpet. Masland makes 100 percent recyclable wool carpet that is free of dye. In addition to being environmentally conscious, it’s also stylish – because of the lack of dye, each carpet may differ in color slightly based on the color of the sheep, making it truly one-of-a-kind. Cork flooring is another great alternative to traditional wood flooring, and is a renewable resource – a typical cork oak tree can be harvested up to 20 times during its life.